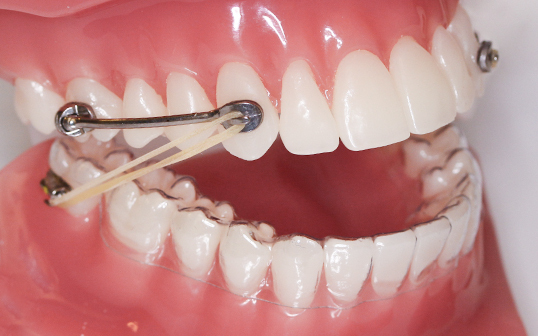 The CMA® involves the use of an appliance called a distalizer which attaches to the canine tooth and the permanent first molar on each side of the mouth. The appliance is individually sized and bonded to the buccal (cheek) surfaces of the cuspids and first molars utilizing standard composite resin (dental glue made from the same material as sealant or filling material). 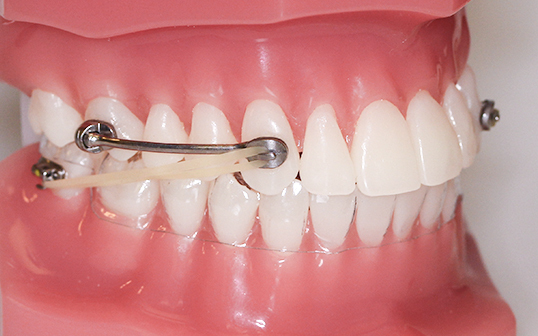 A tooth on each side of the opposing arch will be selected as an anchor, and an elastic band will connect the anchor tooth to the distalizer. The CMA® provides an alternative way to address posterior malocclusions (mis-aligned back teeth) before braces or Invisalign® therapy is commenced. It delivers a light, uniform force or distal (backward) movement with controlled, favorable rotation of the molars, moving the whole canine to molar segment as a unit. Treatment time takes approximately six months to complete (with good compliance) and can greatly simplify and improve the outcome of orthodontic therapy. We encourage patients to rinse with water after eating to help clean the appliance. Brush and floss as usual, taking special care to clean around the CMA® anchors on the cuspids and first molars and the elastic anchors placed in the opposing arch. Upon initial placement, there may be some cheek discomfort as the mouth acclimates to the appliances and the elastics. Any discomfort experienced by the patient should disappear within the first week of CMA® usage. Read your favorite book, magazine, etc. to yourself in front of the mirror for five minutes a day – your speech will be perfect in no time. The patient may experience minor soreness for a day or two in the areas of the molars and cuspids as the teeth begin their movement. Normal NSAID (non-steroidal anti-inflammatory medication-Advil® or Tylenol®) may be helpful if necessary.